Istanbul has absorbed some 450,000 Syrian refugees out of more than three million in the country. 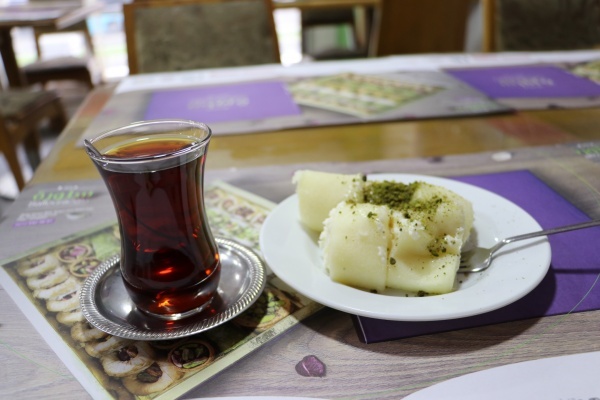 On a recent visit, I looked at how two Syrian restaurants now operating in Istanbul are keeping the food culture of Aleppo and Damascus alive in exile. You could almost believe that we are in Damascus: from the ornately carved wooden front door, to the Arabic tiles on the floor, the traditional bread oven, and especially the food, the Saruja restaurant in Istanbul is a piece of Damascene culture transplanted to the heart of Istanbul. According to Wassim Jubaseeny, who manages the restaurant, it is also a place to remember: he estimates that eighty percent of Saruja’s customers are Syrians in exile in Turkey, coming to get a taste of home. Food, after all, is memory. Kibbe lubaniah, meat cooked in yogurt sauce. Kibbe is a Syrian specialty. The original Saruja restaurant is in Damascus, nestled in the heart of its namesake: Souk Saruja. The neighborhood outside of the Damascus city walls is famous for the striped Mamluk architecture that graces its oldest buildings, for the old Ottoman wooden houses that hang over the alleys, with their wooden window frames and ornate front doors, for the Hammam al-wardi, one of the city’s most authentic hammams, and for the quarter’s many cafes, where Damascenes sit and smoke nargileh and talk late into the evening. But with the war, and the nearly three million Syrians who fled to Turkey, with 450,000 in Istanbul alone, there was a need for building Syrian tradition in exile. Bilal Khalaf, owner of the original Saruja, decided to expand to Istanbul. 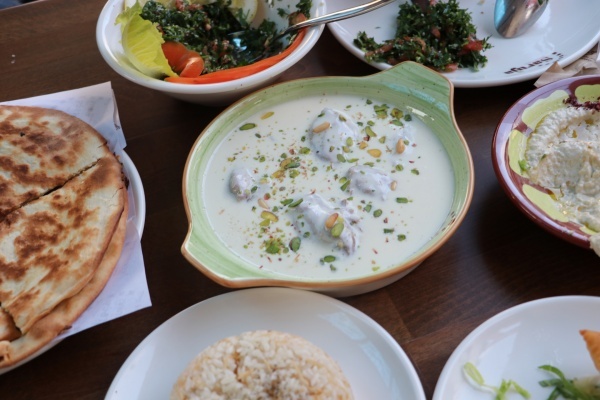 The first branch of Saruja opened in the Fatih district, which houses so many Syrian refugees that it is often referred to as “Little Syria.” The restaurant recently moved to a newer location nearby. 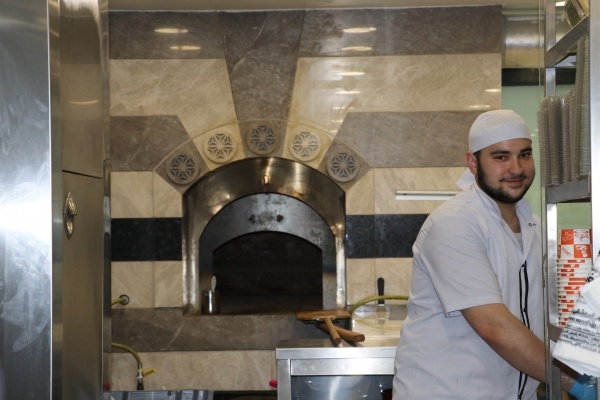 And though the restaurants may be in Istanbul, it is easy to forget: almost all of the workers are Syrians from Damascus, with experience working in the city’s famous restaurants. The food at Saruja is also unmistakably Damascene, and served with as much attention to the flavors as to how it is presented on the plate, a testimony to the city’s history in handicrafts. The bread oven at Saruja’s restaurant recalls the Mamluk architecture of the Saruja Quarter in Damascus. Jubaseeny arrived from Syria four years ago, and began working at Saruja two years ago. A conversation with him on the restaurant’s specialties lasted several minutes: there was ouzi, a remarkable dish of lamb and vegetables cooked inside of flaky phylo dough; kibbe lubanieh, Syria’s signature kibbe cooked in a sauce of yogurt, yabra, or stuffed vine leaves, and harra bi isbaou, literally “burnt fingers”, a dish of lentils, pasta, crispy onions and fried bread that is so delicious that tradition says people would burn their fingers because they couldn’t wait for it to cool before they ate it. And that was just the beginning: he brought out photos of their other specialties, from okra to kebab hindi, mansaf to zucchini stuffed with yogurt. For dessert, there was baklawa, kneffeh, or the famous Syrian desert halawa bi jibn, a cheese pastry stuffed with cream. 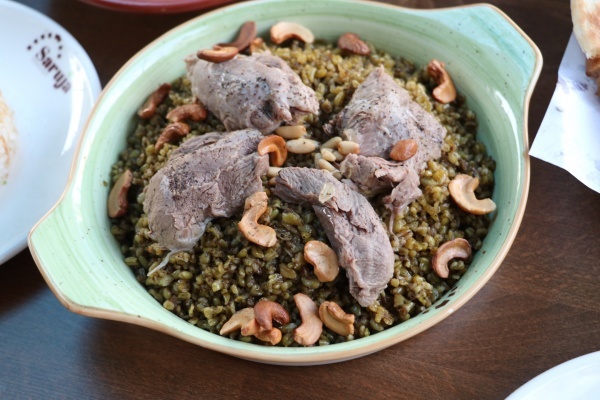 Meat served with freekeh, smoked and cracked green wheat famous in the Levant region. Syrians are famous in the Middle East for the attention they give to the presentation of food. 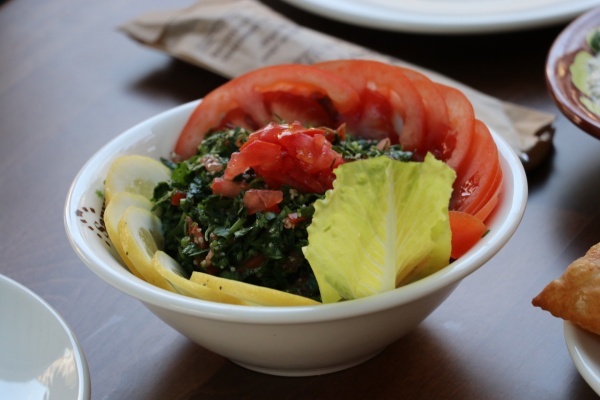 Here a simple dish of tabbouleh is elevated to a work of art. I myself had come to the restaurant with Syrians from south of Damascus, and the food illicited a combination of reverence and longing. One of my companions pointed out that the tiles on the floor resembled the tiles in his old house. I noticed that the traditional bread oven had been built with alternating black and white stone— an homage to the Mamluk architecture of the Saruja quarter. I looked up at the ceiling, only to notice that the rooftop was open to the sky—just like a Damascus courtyard restaurant. A’zad Nabo, a third generation pastry chef, serves up sweets at Salloura. In the heart of the Aksaray district of Fatih—Istanbul’s so called “Little Syria”, is another transplanted Syrian restaurant, this time from Aleppo. Founded in Syria some 150 years ago, the Salloura restaurant serves Syrian food—including Aleppo’s signature dishes of kibbe siniyeh and kebab halabi— but most of the restaurants patrons flock here for the desserts. 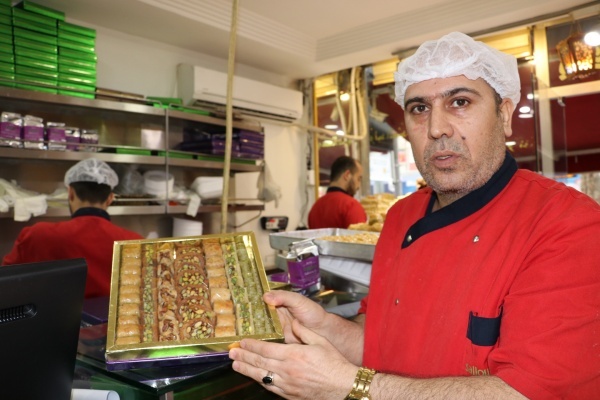 The Salloura sweet shop was famous in Aleppo, after all, and since Turkey is the closest border to Syria’s north, many of those heading here are native Aleppans seeking a taste of home. Most of the restaurants chefs and staff also come from Aleppo. Aleppo was once known around the world, and especially in the Middle East, for its incredible cuisine, a gastronomy that benefited from its place on the Silk Road as well as the excellent agricultural land around the city. It was the only city in the world outside of Paris to be awarded the Grand Prix of Gastronomic Culture from the International Academy for Gastronomy. It is not unusual to hear Syrians wax poetic about the city’s ingredients, particularly its pistachios, which are called “fustuq halabi”, or Aleppo pistachios in Arabic. The Aleppo cuisine was also famous for mixing sweet and salty, using cherries and pomegranates in many dishes. Aleppo pistachios, or “fustuq halabi,” are featured prominently in Salloura’s dishes. The genius of Aleppan cuisine is in evidence at Salloura, as the front displays more than a dozen varieties of desserts. A’zad Nabo, who arrived from Aleppo three years ago and who is now a leading pastry chef at Salloura, tells me each by name. There is baklawa, of course, some using peanuts and some with pistachios; there are two kinds of kanafa, the sweet cheese dessert made famous in the Palestinian city of Nablus but beloved throughout Syria, as well as the Aleppo version using shredded pastry and clotted cream; there is sh’aibiyat, phyllo triangles filled with sweet clotted cream; muhalabiya, or milk pudding; harissa, a semolina cake; there are cups of ‘ashta, sweet cream eaten almost like a pudding, there is ballourie, a kind of baklawa of pistachios between white phyllo nest layers, sweetened with rose water; and ousmalieh, round layers of phyllo nests with cream in between. But Salloura is most famous for its halawat el’jibn, a Syrian dessert of sweet cheese dough made with semolina and then stuffed with further cheese, covered with pistachios and drizzled with rose water, which during the war has taken on a huge following in exile. 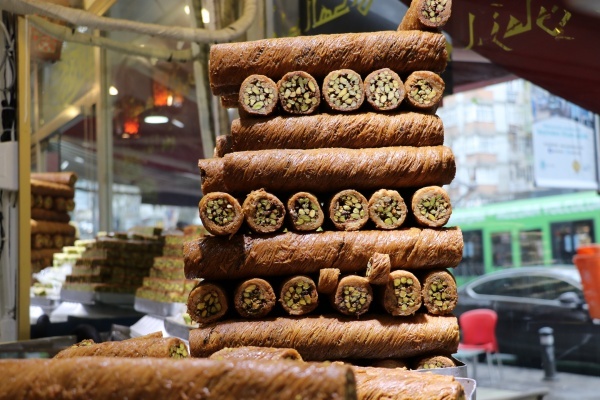 It is heavenly; and patrons flock to Salloura to eat again this pastry that was once so famous in the cities of Hama and Homs that the buses between Aleppo and Damascus would stop there, just so people could eat it. In Salloura they celebrate the dessert with giant signs of it on the walls; and while all halawat el-jibn is delicious, they have upped the stakes by adding pistachios into the dough itself. Halawet el-jibn, Syria’s most famous dessert. Salloura also sells handmade ice cream, and they are particularly proud that they still offer the varieties known in Aleppo. I tried cherry ice cream, ice cream made with ‘ishta, or clotted cream, and even a delightful ice cream made of almond milk, a Ramadan drink. And while Damascus might be the most famous city in Syria for ice cream due to its legendary hand-pounded Bakdash ice cream, Nabo insists that Aleppo’s is even better.